EDINBURG — Hidalgo County will begin negotiating with a Houston builder for the construction of the new courthouse. County commissioners decided Tuesday to begin negotiations with Morganti — the sole bidder for the construction manager at risk position. The firm’s website boasts an array of projects that include governmental facilities, buildings for schools and colleges, and at least three courthouses: the Kings County Criminal Courthouse in Brooklyn, New York, the Manhattan Family Courthouse in New York City, and the new Abu Dhabi Courthouse Complex in the United Arab Emirates. 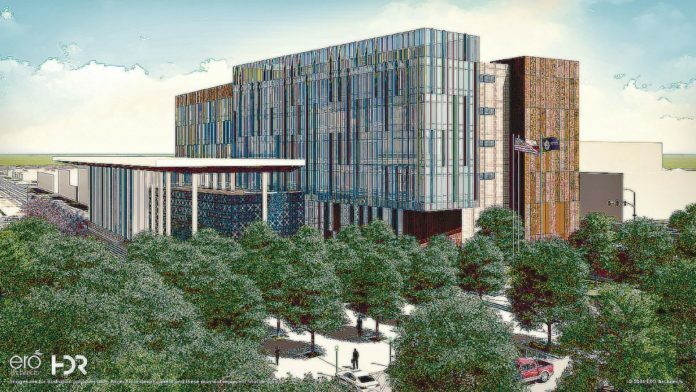 Commissioners and representatives from Jacobs, the program manager for the project, scored the sole bidder separately and agreed Tuesday that Morganti was qualified to carry out the courthouse project. And even though no other bids were received, the county and Jacobs ensured the process remained competitive, said Brian A. McIntyre, a senior project manager at Jacobs. General conditions and fee are generally considered overhead costs and profit margins. “I’m confident that we got a competitive number,” McIntyre said. The firm and two other potential bidders previously met with the county and the program manager to discuss details about the request for qualifications before the submission deadline. Morganti did not know it would be the sole bidder, he said. McIntyre also gave commissioners an update on the overall project. HDR, the architectural firm, is under contract and nearing completion of a schematic design, he told commissioners Tuesday. Both entities have spoken about bringing in a construction manager at risk so that they can also assess the budget and perform a constructability review for the courthouse. Kummer, of Morganti, said his firm understands the courthouse is a public project with limited funds. “It’s obviously a very important project, so it’s important for us to be good stewards of the available funds … and complete it on time as needed for the community,” Kummer said. Bringing his firm into the mix will help finalize the cost of the project. Morganti will, among other things, ensure value engineering and value management “not only for the upfront dollars, but as well as the life cycle of the building and operating costs down the road,” Kummer added.